How would one describe the innate healing power of water? For centuries, people all over the world have made pilgrimages to various hot springs, places where the water teems with a natural reserve of minerals and a temperature that tends to sooth not only the body but the mind. Historically, the first person to witness the curative properties of spa-therapy within hot springs was the Greek historian Herodotus, 484-410 B.C. The man who is considered the founder of medical science and hydrotherapy, Hippocrates od Cos (460-375 B.C.) was documented in his detailed inspection of bodies of water, ranging from lakes formed by rain and also the water that merged from cracks and fissures in rock. He recognized that unlike the rain water, that which emerged from the earth was ripe with minerals ranging from iron, silver, gold and sulfur. The therapeutic qualities of spa-therapy was practiced by Romans and many of their baths still exist, although in protected ruins all over Europe. 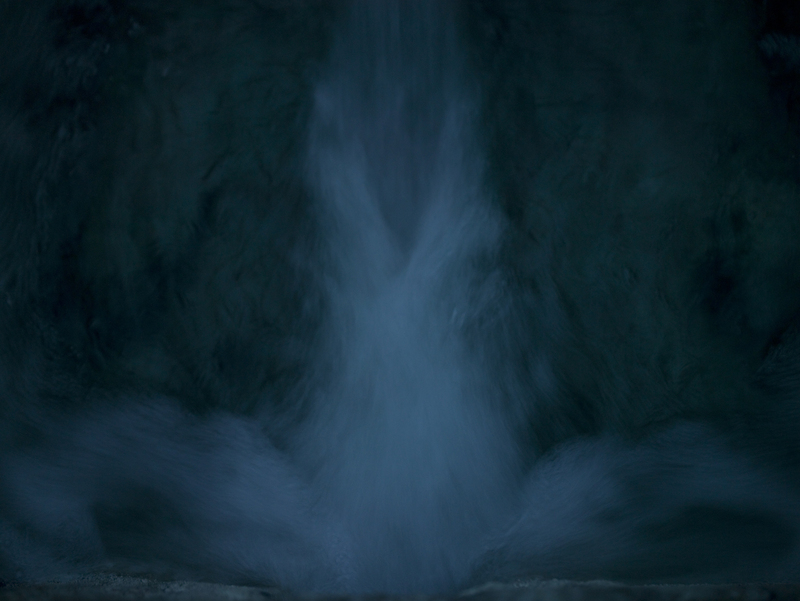 Immortal Water is an ongoing, series of photographs by Takis Spyropoulos. The body of work was inspired by the photographers numerous trips to hot springs in Greece and the recognition of the medicinal properties in the waters. He found himself thinking about the extreme economic strife that the country is facing and the visual interpretation of healing its people through water. In an ambitious gesture, he commenced upon visiting hot springs both on the Greek mainland and surrounding islands, photographing friends partaking in the rush of water. Not choosing to pose his subjects in particular ways, he was more of an observer, someone who allowed the individual to seek out their own positioning and comfort within the extensive constrains of clear blue pools. As he documented bodies, undressed, glistening with dampness, he also started to recognize the aesthetic metaphor that he was facilitating. As the body returns to the warm cocoon found in mineral water, simulating the womb, will a sense of rebirth occur? The goal of Spyropoulos’ photographs is to rediscover the beauty and purity of Greece, off the beaten path and away from the protesting and chaos happening in the urban centers. Due to lack of employment opportunity many Greek youth have chosen to pursue studies and employment outside of their country. This is a phenomena happening in many countries in Europe as debt grows and businesses close. Greece has been hit particularly hard as corruption has played a huge role in widespread tax evasion and bribery that is an avid part of the cultural norm. Strikes ranging from lawyers, pharmacists, journalists, public transportation employees, and others are being performed in Athens on a daily basis, upsetting the normal flow of life. The situation is dire, but for the country to raise the money it desperately needs to start paying off bailout fees (and even the accumulating interest) to the European Union, things need to change, and taxes need to be raised. Amongst all of this chaos, Takis Spyropoulos, who being based in Athens, feels the negative economic changes on a daily basis and has chosen to turn his camera lens back on the country itself. However, rather than focus on the riots and police that can be found on almost every other corner near the city center, he instead has chosen to return to the essence, the earth itself and what he deems the possibility of catharsis. In the submerging of the body into water, a renewal or baptism is evident, cleansing the exterior with liquids from the depths of the earth but also refreshing the mind as well. Every artistic obsession starts somewhere and sometimes with a question yet to be answered. The work itself may not prove to be true, a solution, or even timely reflection, but it is a wish, research, a regression into a place filled with proposed innocence. Immortal Water is one man’s vision but what could be the vision of many. Spyropoulos has tapped into the spiritual journey that is actually quite human in origin. He strives for renewal, comprehensive engagement and change. All are possible, but for now, we are only left with the photographs. Inaction is the antithesis of change. Silence will only breed silence. Moreover, protests may or may not equal political resolution but the metaphor and constant renewal of flowing water functions almost as a prophecy, an intersection of natural elements that will always remind us of our own humanity and flesh.